What Day Of The Week Is July 14? 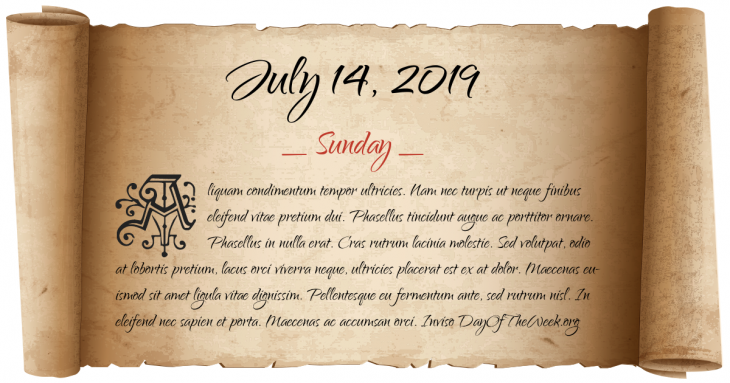 July 14, 2019 is the 195th day of the year 2019 in the Gregorian calendar. There are 170 days remaining until the end of the year. The day of the week is Sunday. An expedition led by Gaspar de Portolà establishes a base in California and sets out to find the Port of Monterey (now Monterey, California). Korean War: North Korean troops initiate the Battle of Taejon. Who were born on July 14?